Zanafor's Discovery - Collection 4 - "Lawmen and Samurai"
Can Deadeye Dan use his Sharpshooter special power on one opponent when still engaged to a different opponent? As a unit that follows Ullar, Deadeye Dan may benefit from Acolarh's ULLAR'S AMULET movement bonus. As a Unique Human, a destroyed Ebon Armor you control may be placed on Deadeye Dan's Army Card to replace Deadeye Dan upon his own destruction. 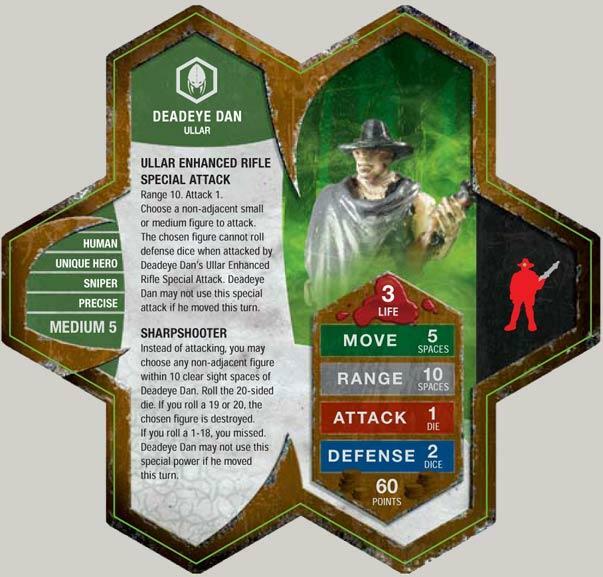 As a Medium Unique Hero, Deadeye Dan may benefit from Myrddin's 20-sided die enhancement. In most cases, I find it more helpfull to use the enhanced rifle because the sharpshooter has never done me much good. I'll take a 50% at 1 damage that a 10% chance at an auto kill. I'm kinda stupid that way but it will pick off squads. Garet Jaxx's Home, the official Heroscape Storage Site. Deadeye Dan is the number 4 best squad killer, behind Braxas, Grimnak, and Suduma. Plus, with a range of 10, it will take your opponent at least 2 turns to get to him, most likely even more since (if you're smart) he'll be on height. With sharpshooter, it gives you a 1 in 10 chance of killing a figure instantly. If you put him on a castle or extreme height where it'll take you opponent a looong time to get to you, he is deadly!!! If you use him wisely and stratagetically(sp?) he will be the MVU(most valuable unit) for the game, but if you use him badly he will fall very easily. Whenever I use him, he's always worth his points. -Using Deadeye Dan will probably get you punched in the eye. Using this figure will give you a bloody nose. I find Deadeye to be a metagame choice. He is a cheap and effective way to deal with the Krav and Nakitas, bypassing their strong ranged defensive abilities. He isn't quite as effective against common squads, but he does well to bypass the defense of the minions and sentinels, and is great at picking off strategic squad figs that find their way onto height. Also, there is something to be said about giving him the last order marker and taking a random sharpshooter chance at Q9, Jotun or a dragon. Just give me Sir Dupius, and be done. I built that same army in the competitive 500 point build thread. The problem that we discussed there is the amount of points you have to spend just for that movement. Personally, I still plan to try it. The other figures I had were Syyvaris so Theracus could pull the trick twice and a set of Aubrien arhcers. Both take advantage of Acolarh. The archers feed off the Frenzy bonus from the Warlord. This unit is made for an approaching orc army, DED guns them down on the top of the hill, dodging grut arrows, but when the Orcs reach him, Vipers come in and swarm. That might get you somewhere against approaching Krav Agents or Tagawa Samurai, but against orcs you need something that can kill more then one a turn. 2 things (1) how is his primative gun better than the airborne elites or a deathwalker? and 2 how can he 1 shot a hive, its HUGE no way can 1 little bullet kill a hive. i don't get the logic behind it, it's total . One, his gun is probably not that much better than theirs; it's his skill that makes the difference. He has different training and experience. Two, the Hive is a living thing. I guess he can hurt it because it has organs or something in there that he can aim for. Sharpshooter doesn't work on destructible objects. Again, it's his skill that defeats the Hive, not the power of the round he fires.